Human Rights are supposed to be absolute in Canada. Unless you're Indigenous. It is why I have become involved in the native mascot issue. It seems that common courtesy and the dignity guaranteed by the Human Rights Act of Canada and Code of Ontario does not extend to Canada's indigenous. 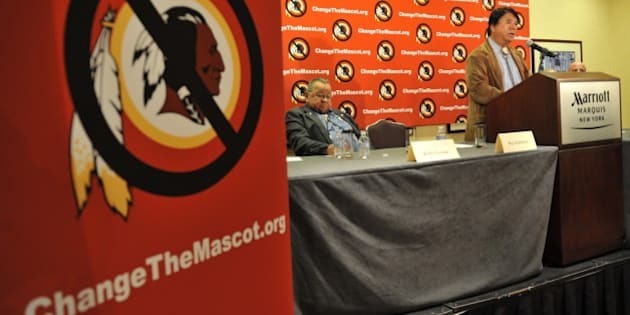 To create change my intent is to take on the financial supports of native mascots. The case vs Mississauga seeks to end government subsidization or affiliation with organizations that promote discrimination. I am committed to a precedent for this case since the ruling will end most native mascots in Ontario, and maybe Canada. University of Alberta Aboriginal Law Society, hear me, you can write a better complaint against the Eskimos than I can. To date, one organization is changing their logo: The Lorne Park team. I thank them for that. Mississauga still maintains that they have no control over what their affiliates post on their walls. Welcome to the special type of malarkey reserved for the Canadian indigenous. 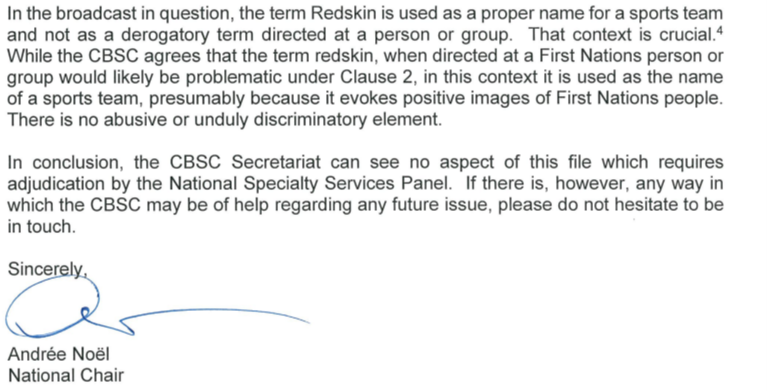 Second, the positive image fallacy, the notion that mascots honour us as they dehumanize us, can no longer be accepted as fact when they are counter to harassment standards in Canada. Broadcasters and the Canadian Broadcast Standards Council (CBSC) can no longer use this as an excuse and must put offensive language warnings on Washington Football games. An offensive language warning on NFL games would limit advertising revenue and increase pressure for the change. 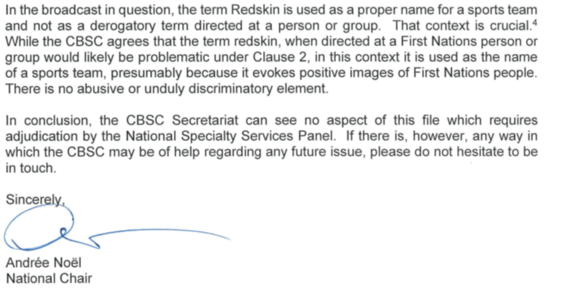 The CBSC does not see a problem with Washington Football games, they even believe that Washington Football was not offensive since Redskins "evoke positive images of first nation's people," a standard has been proven false with regard to sexual and other forms of harassment. Their opinion is consistent with what I believe to be a blind spot with human/civil rights with regards to native people. Only indigenous are denied human rights protections. I am pretty sure that is the definition of racism. The positive image fallacy trumpeted out by the CBSC has proven false in other harassment cases. There is an old saying that "Blondes have more fun", that does not mean they are not subject to lesser protections from sexual harassment. The positive image fallacy is malarkey, without that construct the CBSC cannot say a 4 hour broadcast, where known racist slurs and imagery are used repeatedly, is not offensive. In broadcasting, this oversight is rampant as sponsors commitment to human rights is repeatedly defeated by corporate profit. It seems ESPN, civil rights champions of the Asian Community, has no such aversions to offending the Native American community. I guess their parent Disney was not really that sorry for earlier depictions of the native community in Peter Pan. Further, sports anchors are given an option to use the name of the Washington Football team. Imagine if other slurs were a matter of personal choice, as if racism were a matter of conscience. Third, sponsors like George Brown College must no longer advertise with Washington Football. Advertisers with native mascoted teams demean their indigenous employees and customers, and I believe, create a hostile environment. On 12/26/15, the advertisement with a Washington football game from George Brown College, a government funded institution and aboriginal educational partner, shocked me. I emailed the VP and asked that they apologize and enact measures to prevent it from happening again. Most importantly, I am shocked by them blocking my content when I attempted to contact aboriginal students and professors at the College to see if they would take the issue up with admin. VP Thompson believes that my issue with the College's advertisement is "killing a mosquito with an elephant." But that is exactly the point. The College advertised with an organization that knowingly promotes racism towards Canada's indigenous and rather than apologizing for her error, she likened the affront to our Indigenous dignity as a mosquito bite. The arrogance of this response is shocking; I am certain that she would not take incursions against others dignity and human rights so lightly. Finally, I will use the preliminary opinion from the Human Rights Commission to challenge clothing policies at schools on April 12, 2016. That date is 140 years after the signing of the Indian Act. On that day, I hope others will join me to accelerate the process of making make it unprofitable and socially unacceptable for organizations to discriminate against Canada's indigenous. Well sir, I believe longstanding traditions teaching children through example and obeying the law outweigh your traditional dehumanization of the indigenous. You have sacrificed the celebration of Christmas to a belief in equality but yet you are unwilling to sacrifice your celebration of racism! The cultural indifference towards indigenous reaches all strata of our society. The people I have encountered are intelligent people educated in the belief that treating Canada's indigenous as less was a cultural right. To create change we must test our government's performance against its own laws. But I fear that our human rights ideals are enforced by a human rights governance that is prevented from independently interpreting and enforcing the law. Court rulings are dampened by political influence and delay in acting with regard to first nations issues. Otherwise they would interfere with the government's primary goal of minimizing the long term financial cost of first nations agreements. We are not a true partner, a treaty counterpart. We are a liability to be reduced, originally through extermination, starvation, cultural elimination, and now bureaucratic disqualification. If my efforts fail, it will reinforce my cynical views that these institutions are toothless kangaroo courts of consensus, guided by barometric pressure not magnetic force, representing Canada's cross fingered commitment to human rights. •	Native children cannot go to school, a mall, an arena, watch TV or browse the internet without institutional and corporate sponsored racism. And mascots reinforce the conditions that perpetuate institutionally sanctioned racism against the indigenous. So I am asking our leaders to question what we as Canadians believe in. Can we allow our ideals to be ignored? Or will we allow them to be redefined by a NFL owner intent on spreading hate? I am hoping we will not. And I am asking and encourage others to ask our Human Rights courts to extend its protections to all people. I am asking our Premier, whose position was made possible of through Ontarian's belief in equality, to be a champion of human rights other than her own. Reconciliation must first begin with an acknowledgement of our humanity. BECAUSE THAT IS WHAT CANADIANS BELIEVE IN! And to that meathead in DC, that was in caps!